The publicity stunt known as the “Crash at Crush” happened on Sept. 15, 1896 1For more about the 100th anniversary you can read the Baylor University Lariat’s account here.. It took place at the short-lived (one day, to be exact) town of Crush, TX., near Waco. A locomotive crash staged several months earlier by the Columbus and Hocking Valley Railroad near Cleveland, Ohio, had been a great success, attracting 40,000 spectators. William George Crush, a general passenger agent at the Katy Railroad, thought it would make for a great publicity stunt, so he proposed a similar event in Texas. The Katy wouldn’t charge for the event, only the price of train fare to get to the event. He ran the idea up the Katy flagpole and was given full control of putting on the spectacle. Posters were made up for the crash, but little paid publicity was needed since almost every major newspaper was providing free publicity of the event. The crash was set for September 15, 1896 and the crowds filed in to central Texas the days preceding, mostly aboard Katy trains. Crush, a friend of P.T. Barnum, borrowed a tent from the Ringling brothers to be used as a restaurant and built a wooden jail in case there were pickpockets and drunks. Crush, with the help of Katy engineers, laid out the logistics of the crash, setting up the impact point in front of a grandstand filled with V.I.P.s. By the day of the event it is estimated that up to 50,000 people were at the site, creating a town for a day, which was appropriately called Crush. In 1896, Dallas had just 40,000 so for that one day Crush may have bested Dallas for the title of Texas’ largest city. At 5 p.m. the two locomotives set up about a mile from each other and put the peddle to the metal. Maximum speed was reached at 90 miles an hour, and they set off cherry bombs laid on the tracks to create small explosions as the trains traveled along. The two trains met ten feet north of the designated impact point, which was close enough according to the Katy engineer’s calculations. Three large explosions quickly followed one after the other. The first explosion was the collision of the engines, then the next two explosions were the boilers of each train exploding. Both the photographers and V.I.P.s’ stands were immediately pelted with shrapnel. The official photographer for the event, Jervis Deane of Waco, was hit by a piece of metal that put out his eye and embedded several pieces of metal in his head. The storm of the shrapnel occurred so quickly and the crowd was so closely packed together that it was impossible to run for cover. Three people died and several dozen spectators were injured by the exploding locomotives. One of those killed was sitting in a mesquite tree and was nearly decapitated by a length of chain. The explosion was so powerful that a piece knocked a woman unconscious half a mile away. Some were even injured as they attempted to pick up the scalding metal on the ground as a souvenir. The injured and the families of the dead were paid by the Katy. Crush was fired immediately, but rehired a few days later without the general public’s knowledge until he retired from the company. 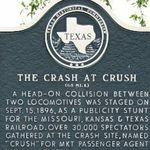 The “Crash at Crush” was immortalized by famed Texas composer Scott Joplin in his march, “Great Crush Collision.” 2Huh. Sheet music for the Scott Joplin piece can be found here. Share the post "The Crash at Crush"
Next Post: What Were the 8 Possible Test Sites For the Atomic Bomb? MandaB on Is Laura Linney a Good Bad Actress or a Bad Good Actress? PK on Is Laura Linney a Good Bad Actress or a Bad Good Actress? Jennifer T Cole on Is Laura Linney a Good Bad Actress or a Bad Good Actress? Tom on George is a Monkey, and He Can Do Things That You Can’t Do. Ever.